Preheat a barbecue flat plate or chargrill on medium-high. Brush both sides of the chicken evenly with the oil. Season with pepper. Add the chicken to the flat plate or grill and reduce heat to medium. Cook for 4 minutes each side or until cooked through. Transfer to a plate. Cover with foil and set aside for 5 minutes to rest. Meanwhile, use a small sharp knife to cut down either side of the mango seed to remove the cheeks. Peel and cut the flesh into thin strips. 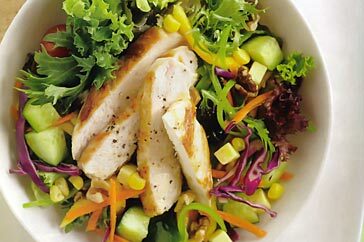 Combine the mango, salad mix, cucumber, snow peas and walnuts in a large bowl. Add the French dressing and toss until well combined. Thinly slice the chicken across the grain. Divide the salad among serving bowls and top with the chicken. Season with salt and pepper. Serve immediately with bread, if desired. The Calypso mango has a small seed and fibreless texture. It's firm when ripe, so there's no need to wait for it to soften before eating. Store in the fridge for up to three days.